I really enjoyed making this card, it didn't take too long. The quilled shamrock is large but was easy to make. I added a little extra detail to it by stamping tiny shamrocks on a strip of quilling paper (not a whole strip, just the bit near the end that would be visible), I used the wider quilling paper for this project. 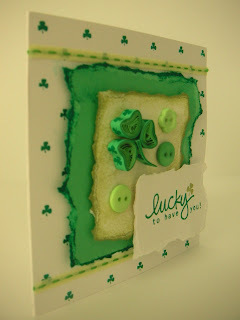 The base is just white card stamped in a repeat pattern using a single shamrock in Emerald green (I snipped the single shamrock off a row of shamrocks stamp). I added two lengths of stitched green ribbon to the top and bottom of the card. I roughly tore a square of green card and rubbed the green ink pad over the edges to highlight it. I tore a smaller square of white card and rubbed the edge and centre lightly with Versa Magic chalk Ink Tea Leaves. I attached these to the card using foam pads. For the shamrock, I joined a strip of a lighter green and emerald green wide quilling strips together. On the end of the emerald green strip, about 3 inches, I stamped a row of tiny shamrocks in Emerald green. I made a open coil shape, pinched this to make a teardrop and squeezed the centre to make a heart shape which resembles the leaves of a shamrock. I repeated this for each of the three leaves. For the stem I used half a strip, glued it back on itself a few times for rigidity and stamped the shamrocks on it. 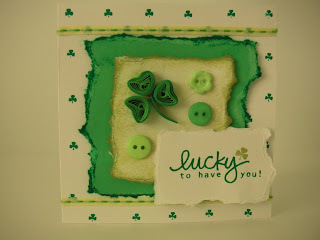 I glued all the elements of the shamrock to the card. I tore out a rough rectangle of white card, stamped the text 'Lucky to have you!' in Emerald green, to get the shamrock in the Tea Leaves green I just rubbed off the Emerald green ink from the stamp with a baby wipe and inked the shamrock with the other green. I added this to the card with a foam pad. To finish I glued three green buttons along side the shamrock. Studio G designer clear stamps, Versa Magic chalk ink tea leaves, Impress Dye Inkpad Emerald. Aww, very sweet card. 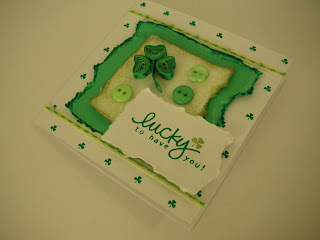 Love the quilled shamrock.